Simon Lee Gallery is proud to present new works by the celebrated French artist Bernard Frize. It was in the mid 1970's, at a time when the medium of painting was regarded by many of his contemporaries as being obsolete, that Bernard Frize began to focus his attention exclusively on the act of painting. With his profound knowledge of Western art history he consciously chose to subvert the act of painting by stripping the medium from its traditional layers of art historical context and, instead, reducing it to its most basic elements: the canvas and the paint. Frize followed the footsteps of great painters like Piet Mondrian and Barnett Newman as he reconsidered the medium's potential by starting from scratch. In his paintings it is not the artist's expressive mood or a narrative he wants to convey, but solely the method of painting. This 'method of painting' determines the outcome of his works. The artist regards himself merely as a labourer and his paintings as 'ready-mades' that are produced by exploring the possibilities by conjoining pre-existent products (the paint, the paint-brush and the canvas). However, when we examine the ever-expanding oeuvre of Frize's art we are not only confronted with a plethora of variations that that medium has to offer but also its seductive tactility and lyrical simplicity. In his latest body of work, complex webs of colour interlace to echo the weave of the canvas itself. 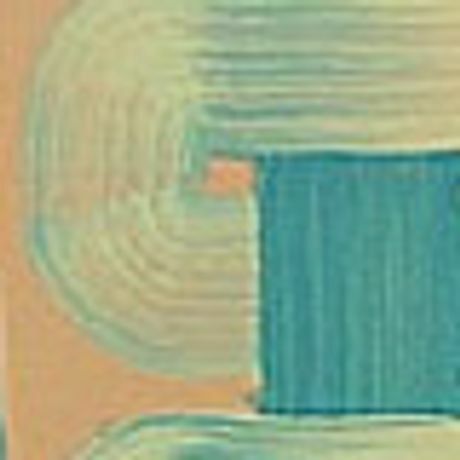 The unsettling palette, where pale pinks and blues combine with browns, greens and mustard yellows, underlined with black, unbalances the eye and destroys the continuity of the single line tracing a pattern on the surface. In high contrast to the rough texture of the canvas, each painting is coated with a smooth layer of resin, lending a plasticity and sense of completion to each painting.